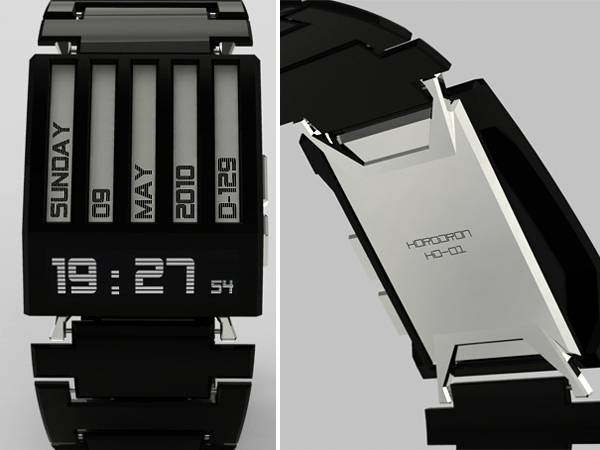 The following concept E-Ink based watch HorodronHD-01 was designed by Jonathan Frey. This watch is made of glossy black metal, embellished with small chrome parts. The display is adjusted with two buttons along the left side of the watch. The bottom display is the lighter gray of the background being used as the numbers display with the black merging with the black of the watch metal. Blasting off into hard bold, bold space with a metal stone. If you’re interested in creative watches don’t forget to check our collection of LED watches. I’m nice, I want to, where can buy? I want to get one? I want to get one!!!! Where can I get it?!!!!! !